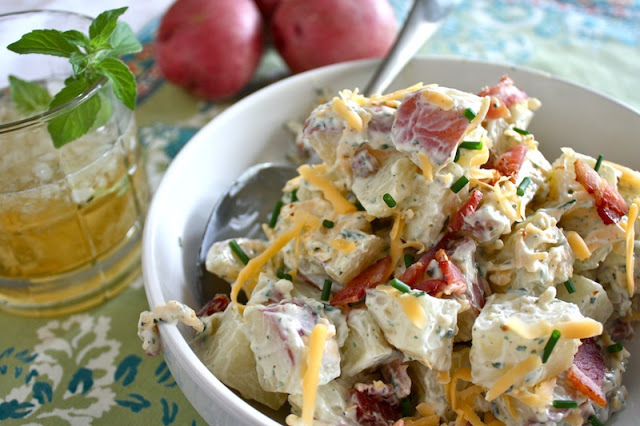 Loaded baked potato salad is the only potato salad you will ever need! It’s filled with all the traditional potato salad fixings, and more with crispy bacon, ranch dressing, cheese and more! You can’t have a picnic without the tater salad. I mean c’mon. They just go hand in hand, you can’t have one without the other. It may be cliche, but it’s true. 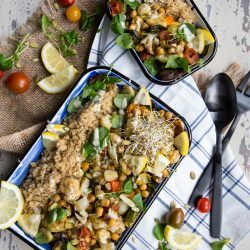 Too often the potato salads served around the family picnic blanket are either tinged with too much vinegar, or the potatoes run the gambit from underdone and crunchy, to so mushy they might as well have been mashed taters tossed with eggs. There is no happy medium. So – how do you find your happy potato salad medium? After taking a page out of the America’s Test Kitchen play book, I felt like I had the mental preparedness and self-confidence to go at it alone. They gave me the tools, it was up to me to see what I could do with them. Daunting, no? Seemed to me that merging the traditional potato salad with the best that the baked potato had to offer was the way to go. How can you pass up potato tossed with creamy bacon, cheddary goodness? 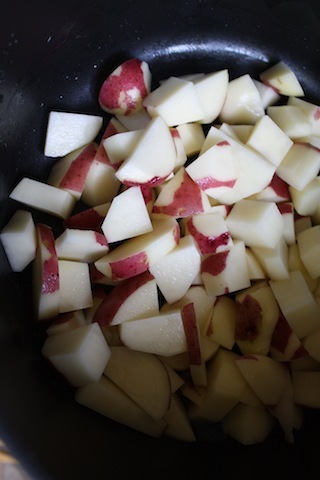 In a medium pot, place chunked potatoes and cover with 1” of water. Bring potatoes to a boil over high heat and reduce to medium, allowing to simmer for 10 minutes, or until the potatoes are fork-tender. If I had done this on my own with no ATK safety net, I would have just plopped those taters into an already rapidly boiling pot of water. That would have only led me down to the path of disaster with little dots of potato haphazardly floating around lacking all structural integrity of an actual potato. Nope, nope – glad I didn’t do THAT. The gentle coaxing of simmering left all of the potato chunks fully intact and perfect done. When they were finished doing their leisurely simmer, drain ’em and place on a lined baking sheet. Immediately sprinkle with the packet of ranch dip and fold the potatoes over with a spatula until the dip mix is evenly distributed. Place baking sheet of potatoes into the fridge for approximately 30 minutes, or until the potatoes are cool. According to ATK, when you put your potatoes back into the fridge to cool tossed with the vinegar and spices of a traditional potato salad they will absorb the goodness and infuse themselves. No bland starches need apply. I figured if the potatoes would resorb the vinegar and spices of a traditional potato salad – why wouldn’t they absorb the ranch-iness of my loaded baked potato salad? I went for it. What can I say, I’m a rebel. While potatoes the pretty taters were chillin’, I fried and chopped 5 slices of bacon and shredded cheddar cheese. In a large bowl, I whisked together sour cream, mayo, pepper, garlic, mustard, and cilantro. When the potatoes were cool, they were poured into the bowl of sour cream goo. Make sure to chill for two hours until flavors meld. Devour. C’mon – you know you wanna. Get more recipes to go with your loaded baked potato salad that are perfect for your summer holidays and grilling adventures! 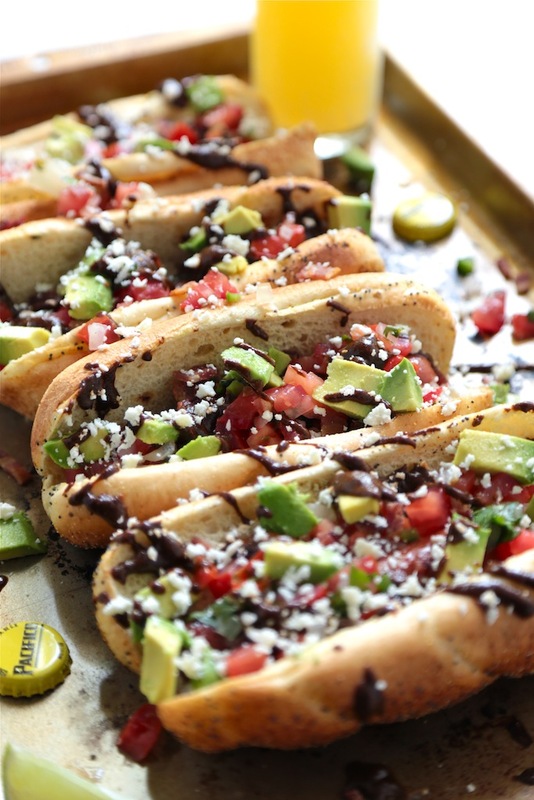 Mexican Mole Hot Dog – Spicy, savory, and packed with flavor! When potatoes are done, drain and place on a lined baking sheet. Immediately sprinkle with packet of ranch dip and fold potatoes over with a spatula until the dip mix is evenly distributed. Place baking sheet of potatoes into the fridge for approximately 30 minutes, or until the potatoes are cool. While potatoes are chilling, fry and chop 5 slices of bacon and shred cheddar cheese. In a large bowl, whisk together sour cream, mayo, pepper, garlic, mustard, and cilantro. When potatoes are cool, pour into large bowl of sour cream mixture. Fold in shredded cheddar cheese and bacon. Sprinkle chives on top of potato salad. Chill for two hours until flavors meld. Devour. Next Post » Ciao, Italia – GIVEAWAY! This looks creamy and yummy! 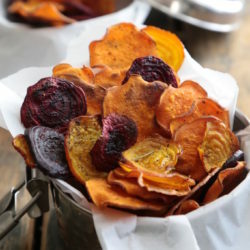 The sweet potatoes in Dijon mustard and mayonnaise and all those special ingredients…oh, my! 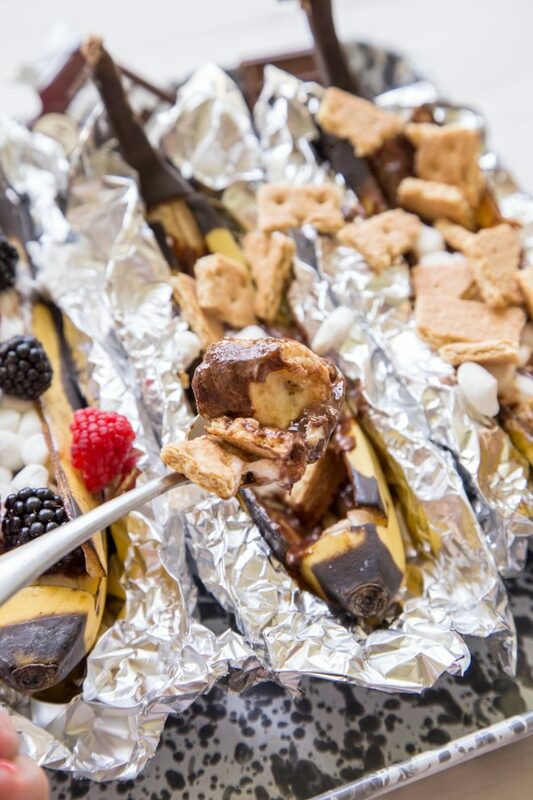 What more can anybody want on a picnic? OMG! its like potato skins!!!! I have to try this!! I found your recipe on Tasty Kitchen and made it today. I do not care for potato salad, but this one I love. We are in the middle of wheat harvest and I will be delivering this to the field today for lunch!!! Looks like I am #100 on your list of followers!!! Great recipe!!!! I made this potato salad tonight to go along with a cheese stuffed burger (healthy right?) and it was soooo good! It is my new favorite potato salad of all time! 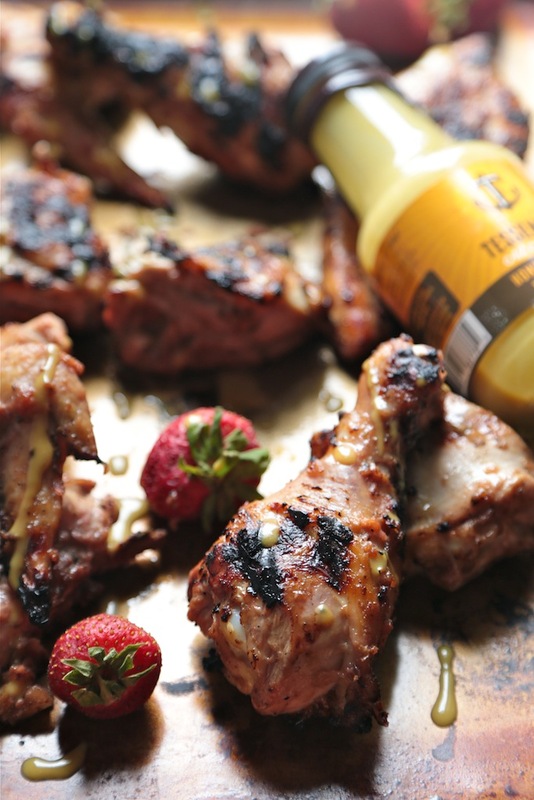 Cooling in the fridge right now….can’t wait for dinner!! OMGooooooooooness! I need this stat! 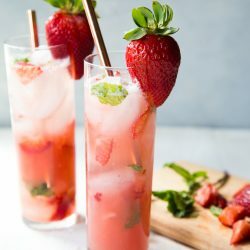 Can this be made ahead ? How long does it keep ?? Hoping to make it for a girls weekend. I made this tonite for ours bbq tomorow. So far, it taste really good! Can this be served warm? Eating a cold loaded baked potato doesn’t sound appealing to me. Oh my goodness, this is so delicious! I just got finished making it, ready to put it back in the fridge for the 2 hour chilling period, but first I decided to take a taste. Well that was a mistake… I couldn’t stop at one taste. It is SO flavorful. Sometimes potato salads are bland– NOT this one! The only different I made was to use about 1 tsp of dill instead of cilantro. I just love dill in potato salads 🙂 Thanks for this amazing recipe! I can’t wait to properly enjoy it! BEST COMMENT EVER!!! Andrea, thank you so much! I’m thrilled you loved this potato salad – it’s one of my favorites, too! 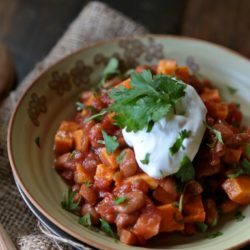 I have just made this recipe exactly as is, and I am waiting for it to chill right now! But I must confess, I tried some already and it tastes Delicious! 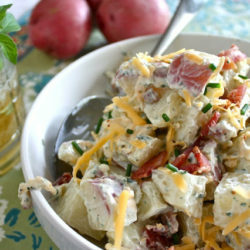 What a great idea to spiff up ordinary potato salad, and very easy to make! Thanks! This is the only potato salad my boyfriend likes! I am making it for a BBQ this weekend. Always a hit. Thanks for the recipe. I made this tonight for my family and it was DELICIOUS!!!! Best potato salad recipe ever!!! 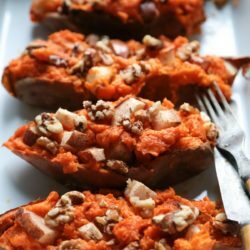 The “baked potato” is because of the fixings in this recipe. You have to boil the potatoes to make them soft. If you actually baked the potato chunks, yes you could also say it is a baked potato, but traditional potato salads have boiled potatoes, which is what I did here. I recommend that it does so the flavors can meld!